Poll: Is Alan Pardew right to claim he's "almost an adopted Geordie?" | NUFC Blog. So, I just thought I would hold a little poll on here to find out how much truth there is in Pardew’s claim. What do you think? Do you see Pardew as “almost an adopted Geordie?” or is he just talking out of his backside again? Do you agree with Alan Pardew's claim that he is "almost an adopted Geordie?" This criticism of Pardew is getting tiresome. The guy was the best thing since sliced bread last summer, now he’s a failure? Please. Just as 2011-12 was a great campaign the last one was disappointing but I have every faith in him to turn things round. Let’s get behind the guy and the team rather than scrutinising and criticising his every comment. Paul: that is not quite true. Worky and a few others on here (Chuck and Andymac come to mind) have always been against Pardew. I was willing to give him the benefit of the doubt but when the facts change, I change my mind. That would seem to be the best course of action. I am happy to know that your view is absolutely correct and thanks for telling me I cannot have my own opinion. Oh, and Joe Hawkins really loves Pardew. Where’s the criticism of Alan Pardew in this piece, Paul? People in my group of friends /fans gave Carr the credit for our good season rather than Pardew , although with credit for his steady handling /introduction of Ben Arfa. Most of the guys felt that the failure to reinforce last close season was an error and wondered how strongly Pardew had fought his corner on that one. Tactics and team selections last season were almost entirely his choice so he can not be excused from some criticism on that front , not even if he gets a note from his Mum , or any other blogger. I see the voting has changed dramatically since my last comment with more nays than yeas, can’t believe how many have given a yea vote though!! He’s going to have to prove himself a bit (lot) more to get my vote. As for the criticism, even in our “good” season it was obvious that we were not playing good football and got a lot of lucky results. I think most of us thought he was running scared and showing no real concept of tactics during last season. I for one would be delighted if he managed to show a bit more nous and the team played better next season but don’t feel too optimistic at the present! The criticism is justified as thing stand!! Is Ryan Taylor ever going to be fit to play again? Grumpy: Ryan Taylor will get fit enough for Joe to ship him out. Can anybody tell me if Gosling is any good? We buy him when he is injured, he gets virtually no playing time and is anonymous when he actually does play. Is there a single highlight from his time at Newcastle? I think he might have scored a goal once, a tap in? Worky: this is a classic Pardew misreading of a situation. How can someone who oversaw the worst performance I have ever seen from a NUFC team (Liverpool) believe he is loved by the fans. I read a few of the blogs and most agree that he is in over his head (the exception might be Troy, enough said). He is not good enough for the premier league or NUFC. His style would probably work in League One. It was Joe who signed him, GS. And Hughton should get the credit for bringing Graham Carr into the club, as he should for for taking Ewan Chester back to Norwich with him from Birmingham. Sadly, he never got the chance to bring in Steve Clarke as his assistant, but I daresay that Clarke doesn’t regret that now. Worky: you are a walking NUFC encyclopedia. Taylor turned out to be a bit of a utility man though, like Perchy, so Joe might want rid. Ryan has that vacant, sad Stan Laurel look about him. Stan was a brilliant actor. Ryan’s face is like that naturally. Personally, I don’t think Pardew is an adopted Geordie. I was not born in Newcastle and have never lived there, but I have supported the Toon for over 40 years but still would not dare to consider myself an adopted Geordie. Besides, I do not think it is something you can claim for yourself, I think it is bestowed; and from all that I have seen and read, I cannot for the life of me see that this has been bestowed on Alan Pardew, let alone how he can claim that it has. Pardew is an arse and always will be. He had one good season and the morons started hailing him as the best thing since slice bread. Well last season was the true pardew returning to form and this season will be no better. Why is everyone giving pardew a hard time he is doing a good job with the tools he is giving from his boss and if he left who would want to come and manage the biggest joke in football good managers would not want nufc on there c.v. and its about time us fans get behind our club instead of always Moaning about something. the whole situation is just shite pardew wouldn’t even be a good no2. I don’t think I was before this site, GS. I think most people know that Ryan Taylor was signed as a makeweight in the Insomnia deal anyway. I have never liked the bloke from day one, And i have opposed his fake flattery, His over the top ego, And his inability to manage any Football Club, In at least the top two divisions. Chris Hughton, Was and is, Head and shoulders above this dupe of a manager. Only got the job because Chris fell out with the management, And has been useless from day one. Even when we had our flukey Season, He was still Atrocious,This Football Club has seen some of it’s biggest hidings, Since he has been manager. This Football Club will probably never win another derby game, With that chump as manager, Because this so called adopted Geordie is in the same boat as Steve Bruce, He just doesn’t get it. He can say what he likes, Because he will be gone shortly, Because they have p***ed Fat Boy right off! And he feels him and Llambias, Have had him over, For signings that made no impact what so ever. If it wasn’t for Ashley looking like a right mug, He would have been down the road sooner. He has been given enough rope to hang himself, And that’s what he will do, In due course. Tonytoon, It’s not about being negative, It’s about being honest. When he leaves Gus Poyet will be straight in there, No doubt about it, And if rumours are to be believed, The adopted Geordie only has a handful of games to turn things around, Otherwise he’s finished! Well actually, I’m more positive than most, Tony. Unlike the somewhat misguided Pardew fans who frequently bash the players for our current situation, especially certain ones, I realise that we already have a very good squad which should be challenging for Europe every season as it is with the right manager. I would never have sacked Hughton in the first place, he was doing the right thing for Newcastle for the long term. That done though, I advocated that we should have brought in Michael Laudrup for last season, who I’ve been a fan of for many, many years but he went to Swansea City. Obviously though, that didn’t fly at the time as we’d just come fifth in the league and most couldn’t see what a flash in the pan that was, and what the underlying problems were. I also knew that Pochettino was a very interesting coach too even though Southampton made a brave move in appointing him at the time they did. This season, I would have gone for Oscar Garcia if I’d known that he’d left Maccabi Tel Aviv, but Brighton have got him now. I would have also looked at bringing in Cruyff Football to work on the coaching methodology. Think we’ll do better next season. A new left back is key as we have been using right kickers on the left side of the defence, we need a left kicker there for balance. Coloccini being present in the middle is crucial, a defence without the captain will always struggle as we found last season. His presence in the locker room will help organise Williamson while Debuchy will show his class on the other side for sure. Will be good to see a reshuffled midfield next season. Pardew has already said that we need to tweak things to get the best out of the players. Hopefully the arrival of a new defensive midfielder will free up Cabaye and Tiote to get forward with Sissoko down the left and Ben Arfa down the right our offense will be a more exciting proposition. Think Cisse will enjoy a season upfront and start scoring again and with Krul improving as a stopper we are strong at both ends of the field. Another striker is much needed and hopefully we can trade Remy and Taylor as drafting Remy would give us another goalscorer and some pace going forwards. Then all is left is to remove the non picks. The deadwood, I think Gosling, Obertan, Yan Mbiwa, Ameobi, Marveaux and Campbell lack ability and need to be cleared from the roster to allow extra players to come in and make the squad stronger. Once all this is done I think we can be at the top end next year for sure. Silvester, That must be good gear your smoking lol. It looks like we have failed again in our quest to get an A licence for the Academy. Reading have been awarded the A licence. If this is true, It is absolutely shameful that a Club the size of Newcastle, Cannot get this Licence. Oh s**t! i forgot to hit the shift key, The grammar police will be out in force! lol. I don’t smoke. I am one of the clean lung brigade. Watch you say you don’t drink, Then after that, I’ll have to say your mad! lol. Each to their own, I wish i could share your level of optimism. Both wings too, Silvester. Benny’s a left footer who’s always on the right now, and Guti’s a right footer on the left. There is nothing wrong with being optimistic, Joe Hawkins, my optimism is not from a bottle or a packet, it comes from the fact we have good players and we just need a few minor tweaks to make the squad competitive as outlined above. Everybody can see we need a left back, defensive midfielder and a striker, once we have those we will have a good side and we can look forward to the games. I just hope the coach can get these players we need. I’m afraid I don’t understand your logic there, Tony. They asked, we didn’t. Do you think that Brighton have more appeal than Newcastle United? Well if this doesn’t cheer up all you miserable buggers, nothing will. Tonytoon, Wake up!, The only person who brings bad vibes to Newcastle, Is Mike Ashley!, And his continual mismanagement of the club. So the crowd volume being raised at St James’ Park, Will turn us into world beaters? It’s your mate Alan Pardew who is so poor of a manager, That has turned a talented squad, Into a bunch of no hoper’s, Who cannot pass a ball between them, And look like a bunch of strangers! There is no way that he will ever change the way he goes about things, So unfortunately it is going to be more of the same. Alan Pardew couldn’t motivate a fly onto a turd! Pardew has made mistakes but at least he has admitted this. Continuously asking Tiote to sit deep when he can’t tackle and constantly tries to get forward is one of them. Hoping he will move Tiote into the number 10 role in the offense and bring in another holding midfielder, somebody like Jai Spearing from Bolton to sit deep and win the possession so Tiote can make opportunities further up the field. Silvester, All you have to do is look at Pardew’s C.V, It is littered with failure. He has made the same mistakes at every Club he has been involved with, What makes you think he will ever change? All the man does is talk a good fight, And is a complete patter merchant, Who never backs up anything he says, And blames everyone around him, For his own failings. All you have to do is look back over his career as a manager, And look at some of his old interviews, And you see a predictable pattern forming, He is rubbish personified! The problem is the answer is staring him in the face. Make this change (put people in the right positions and if you don’t have someone who can play there i.e. left back, defensive midfield buy someone) and we will start winning games again! Toontony: I agree with everything Joe Hawkins says @35 because he is right :) I tried to give Pardew the benefit of the doubt but he makes it very hard with team selections like Liverpool and substitutions like Reading. The Liverpool capitulation, when everybody in Newcastle knew he had picked the wrong team, was the last straw for me. And they gave up and were begging for the final whistle. That’s “Mr. Motivator” for you. He completely failed at the part of his job he is supposedly good at. Pardew makes it easy to make fun of him because of all the contradictory shite that comes out of his mouth. It is this and his overconfidence that makes him annoying. Some of the biggest capitulations and hidings this Club has encountered in recent times, Have occurred under Pardew’s watch. Even when we were supposedly doing well, There were signs of things to come. We couldn’t even beat relegation threatened teams at home, Last season. This nutter Pardew was blaming this on Europe, When in reality he was resting most of his first team squad, And playing fringe players and young’uns. He’s a complete lying b*****d, Who using any excuse going, To hide behind the fact, He is utterly rubbish. Tiote can tackle. It’s more or less all he does along w/short passing. That’s why last season, when he did neither well, he contributed nothing. I’d give his spot to Anita and have him sit in front of the defense w/Sissoko, put HBA on the left and acquire a better right sided mid/RW for the other side w/Cabaye or Marveaux at CAM behind Cisse (who might training away from the squad by the way…). Add another forward of some quality, maybe a depth FB and you’re done. Tiote on a strong bench w/Taylor, Goufran, Marveaux, new FW, Bigi & Eliot. The fact whether we get behind the club or not is not gonna maker a bit of difference, as long as we have the same coaching and manager, with their outdated system and attitudes . What’s needed is a professional approach both in money matters and an on the park management aspect. There appears to be no one between a recent Llambias and Ashley combination in regard to who to sign. Now we have Kinnear who makes it even more confusing, as to who and what’s needed in regards to personel. From where I stand bringing in a guy who has been virtually out of the business for a decade or more, trying desperately to appear he is current in the game, is not the way to go . A recent study in regards to overseas support of the club has shown an unusual amount of regard for NUFC, no doubt regardless of the “no effort ” put in by Ashley and his incompetent management system. It’s about time Ashley brought a modern system of management to the club. Instead of hiring incompetents, because they came cheap, from as various places as Threadnreedle St. To a gambling casino. A multi-mullion dollar sports organisation, like any other , needs professional people to run it , with knowledge of the business, not based upon cheap incompetents such as Llambias and Pardew and their equally incompetent hirelings and it’s time Ashley figured this out. Otherwise we will be condemned as a laughingstock and an also run organisation , as.opposed to to one of the top twenty or so footballing clubst in the world. Are you two for real ? An interesting and timely interruption, enjoyed it ! I don’t really care what he thinks he is or why it even matters, he just needs to get his job done. Adopted geordie nonsense …. who gives a flying …. John Shuttleworth is better than Prozac, Chuck. stevep, That’s the crux of the problem with him, He doesn’t get on with the job. He seems to spend his time trying to blag his way around Football Management. He tries to use over the top flattery, To curry favour with the fans. Throughout a Season, He continually issues fake rallying calls, For the fans to get behind the team. He promises much, But delivers very little, And is always ready with an excuse, When he loses a game. These range from the Referee’s haircut, To the length of the grass, On a pitch, To all out Media Conspiracies against him, ie, Erecting boards around the training pitch, Because he thought people were leaking his tactics to the press ffs! On the Football side of things, Where ever he has been, He breaks records for all the wrong reasons. Only team in all four divisions, Not to score a goal from a set piece, All season, And his reason for this was comical, And something you would expect a bloke in the pub, To come up with. There all a lot more you could bring up about him, And the way they surrendered against Sunderland, Was unforgivable, Not edified for an adopted Geordie! He doesn’t seem to be able to motivate a team, Even before the team take to the pitch, You have to ask yourself what he’s telling them, Because they start matches without any fight, And we continually sit back, And invite the opposition, On to us, And we get overrun in midfield. His substitutions are bizarre, And very rarely change a game for him. He tends to haul off a forward player who is playing well, And replaces him with a Centre half or some other random player, Who brings nothing to the attack. Why was Gouffran taken off at the hour mark constantly, When he was the best performer, In some games? One of his biggest failings, Is his instance of trying to cram any player into his line up, To accommodate them because of status or reputation. Instead of dropping players who are out of form, He continues to play them. He seems like a coward who doesn’t want to upset the squad, And have players handing in transfer requests. He throws all his eggs into one basket, He has an embarrassment of riches in the midfield area, but he tries to cram them all into his starting line up, Hence Sissoko playing as an extra striker. Why is he not creating competition for places?, Surely that is a must in the modern squad game. He’s throwing every player on to give them a game, And it’s detrimental to the squad as a whole, Because too many players are just walking straight into the starting line up. That’s why he never has any options on his bench, Because the idiot is trying to shoe horn anyone and everyone into the starting line up. Why not interchange Sissoko, Tiote, Cabaye, Bigirimama, Etc And you would get more of a response from them. The whole thing ends up a convoluted mess, And you end up with players playing out of position, Players being on their wrong foot, Thus giving the ball away. If all else fails, He has the goalkeeper knocking the ball long, Looking for the striker to get on the end of something, Looking for the second ball, Or trying to hold up the play. This will only ever work if you have a Peter Crouch, Niall Quinn of old, Or an Andy Carroll, But he thinks you can do this with Papiss Cisse. Unless Alan Pardew has a complete turn around in the way he does things, Nothing will ever change. All the getting behind him etc, Won’t make a blind bit of difference. In fact if you get behind him, You are only indulging his ego. I think the fans have been patient with him thus far, More than he deserves to be honest. I will give him one thing though, He has more lives than a cat, In the managerial sense. He must be a good talker, Or complete sycophant, Because he tends to stay at Clubs longer than he should have done. He has been at Newcastle United 18 months longer than he should have been. He has stickability, And has proved on numerous occasions he is willing to be shafted by Ashley, Because he’ll never get a bigger gig, Than the one he has now. This is the man who in his first end of Season could have finished in the top ten, And is leading 3-O against West Brom, At half time. He decides in the second half to make three substitutions, Involving three of his better performers on the day, And upset the rhythm of the side. The west brom striker went on to get a quick hat trick as a result, And we drew the game 3-3, And missed out on the top ten. I knew even then, Just how poor a manager, Alan Pardew is, And all the excuses in the world, Are never going to make up for that! It was their worst run in 70 years, Joe. Worky, it just goes to show you, I underestimated how poor he is. Good job we’ve got you to keep us right on the correct stats, I’m hopeless at remembering the stats lol. Sorry lads and lasses, That text is way over the top, It’s just sometimes you get carried away, And forget how much you are writing. It is really simplistic to say “get behind the team”. There is something rotten in the state of Denmark when we lose 0-9 to Mackems and a slightly above average Liverpool (minus Suarez remember). Toontony @44: it is sort of the point of blogs to let people express their opinions and to suggest what they would do if they were manager. We really don’t have any say and it is an outlet. Sometimes it becomes obvious when someone is f@cking up and I am afraid that that is the case with Pardew now. There is nothing I would like more than for him to be able to harness the talents of Ben Arfa and Cabaye and make us a higher mid-table team that is good to watch (our ceiling I think because other teams have so much more money). 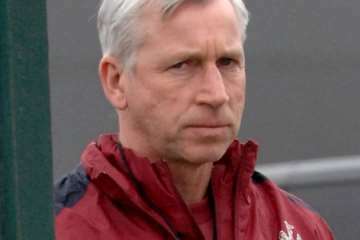 Pardew doesn’t have it in him though, so I will not get behind him. And if you read some of the other blogs and fanzines you will see there has been a gradual shift to agreeing that Pardew is clueless. Who would want to get behind a leader who is leading them off a cliff. Makes no sense. Please Mr. Pardew, prove me wrong. I really don’t want to suffer through another season like last year when I can only really think of one game that was fun (Chelsea). Most of it was a grind even when we got a result (Villa). They’re a bit like us, GS. There a still a few diehards who look back misty eyed at their cup final appearence (or in our case that fifth place finish and Europe) and are somewhat more forgiving of their later slide into awfulness. It’s Charlton where Pardew and Iain Dowie are both unanimously seen as incarnations of the Antichrist. Of course, we’ve had ’em both as managers too because of Ashley and Llambias.